This page is a summary and a table of contents for my projects that deal with powering an arduino system with photovoltaic energy. 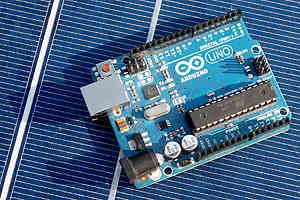 As these boards run on rather low power the arduino platform is a good choice when you want to create a PV-powered microcontroller system. Optimizing the system is the way to make the whole thing efficient in terms of resources and money. Using page mode: The external EEPROM can be written in page mode. This reduces power consumption a lot! Towards a real system: The capacitors are removed, a supercapacitor takes their places.